The Lexus RC-F stands out for the visual aggression it adds to the stylish body of the new RC coupe on which it is based. It features its own version of the Lexus signature spindle grille which dominates the front of the vehicle, with one single F pattern in the mesh from hood line to lower lip. Ducts beneath the front bumper and fenders and strategically placed aerodynamic stabilizing fins create a stance which further identifies the F model. 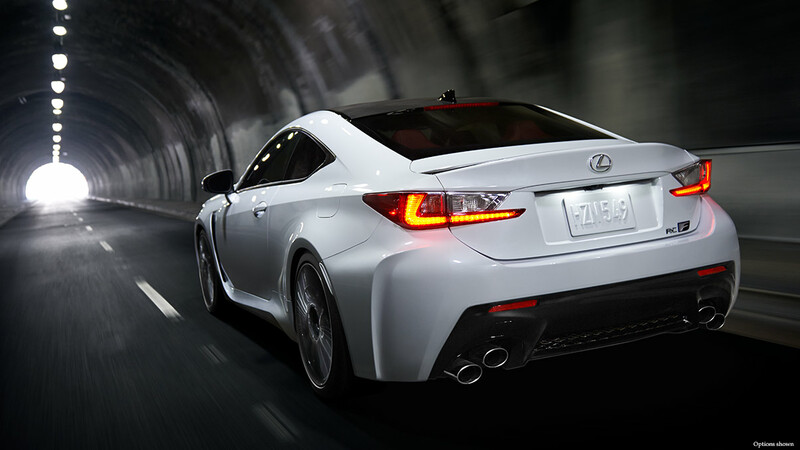 The RC-F employs a comprehensive package of carbon fiber parts drawn from experience with LFA and with a limited edition race car, the IS F CCS-R. The carbon package includes roof, engine hood and active rear wing. The RC-F’s all-new instrument meters are further developed from the LFA while also referencing aircraft cockpit instruments by providing a wide range of information in easily read form depending on the drive mode being used. Information includes a large centrally mounted tachometer that alters according to drive mode, digital and analogue speed readout, differential torque vectoring monitor, G-Force meter, oil and water temperature gauges, mileage information and even a stopwatch. The all-new high back seats of the RC-F have been designed to resemble the look of tight-fitting athletic sportswear to support and cosset occupants. An integrated foaming technique achieves a highly supportive and taut fitting seat that does not suffer from movement of the trim material. The most powerful Lexus V8 F model ever built will use an all-new 5.0L 32-valve engine with cylinder heads and moving parts that provide increased maximum power at higher engine revolutions than has previously been possible. For the first time in a Lexus performance engine, the RC-F uses the Atkinson cycle at cruising speeds for enhanced fuel economy and then it switches to the Otto cycle at higher revolutions to develop impressive performance levels. – Track for consistent, stable behavior, ensuring the vehicle stays on the intended corning line as the driver applies more throttle. Text provided by Lexus International.